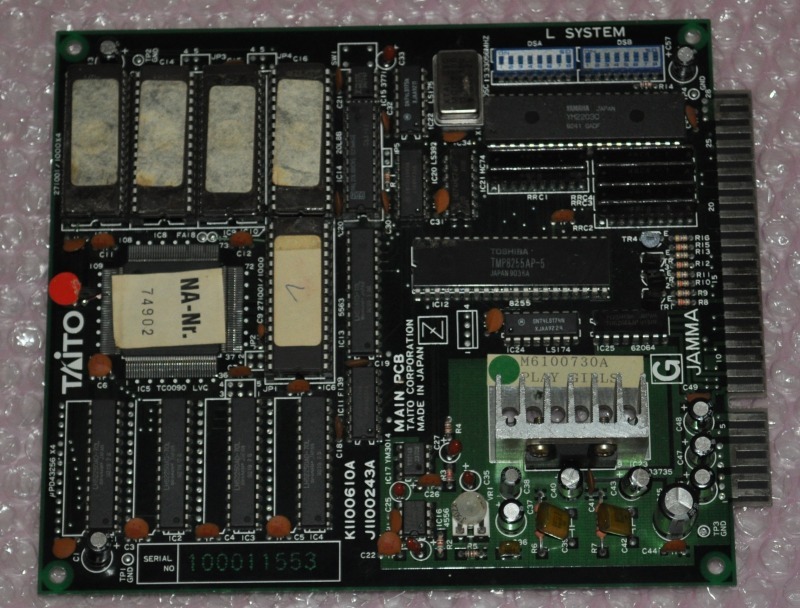 The source of IRQ 0 is /IRQ from the YM2203 in the single processor L System games. Pin 25 (/IRQ) of the YM2203 is connected to pin 37 of the TC0090LVC. Pin 25 is pulled low when either timer-A or timer-B expires, and that triggers IRQ 0. I've looked through the code of all the single processor games and none of them actually start either of the timers (although all of them do actually initialise both timers). MAME currently fires IRQ 0 at scanline 120 for all L System games. I currently own Plotting, Puzznic (effectively the same base board as Plotting) and Play Girls single processor boards and have verified my findings on those boards. I'd imagine that all single processor boards have pin 25 of the YM2203 connected to pin 37 of the TC0090LVC. Steps to reproduce this, on hardware, are detailed below. Fighting Hawk - pin 37 of the TC0090LVC is connected to pin 62 of the TC0170ABT custom. There's very little documentation available for this custom and I've no idea what it does or what pin 62 is. The IRQ 0 routine in the main program is simply a ret statement and IRQ 0 is never enabled. Pin 16 (/INT) of the audio CPU is connected to pin 25 (/IRQ) of the YM2203. The audio program starts the timers and interrupts are generated on the audio CPU by the YM2203, as expected. I own a Fighting Hawk board. Raimais - pin 37 of the TC0090LVC is connected to pin 4 (/INT L) of the MB8421 dual port ram. The slave CPU /NMI (pin 17) is connected to pin 48 (INT /R) of the dual port ram. The IRQ 0 routine in the main program is simply a ret statement and IRQ 0 is never enabled. Pin 16 of the audio CPU is connected to pin 56 (/IRQ) of the YM2610. The audio program starts the timers and interrupts are generated on the audio CPU by the YM2610, as expected. The slave and audio CPU's run at 8MHz (measured by me, on my own board, pics attached). The L System driver incorrectly has them at 4MHz (12000000/3) and states that these are "not verified". I've also verified the TC0090LVC runs at 6.66528 MHz on this board, from pin 5 of the 74F74 (which is connected to pin 122 of CPU). This is shown as "needs verification from pin 122" in the driver. These values are clocked through a 74LS174 to a TD62064 and then out to the JAMMA edge connector. I haven't looked at the control register code of any of the other single processor games but I'd be surprised if it wasn't used for coin counters/lockouts on all of them. Changing the byte at $0bfe back to 30 will allow the game to boot as normal (when running on hardware) as timer-A will not be started. When running on MAME however the code will still jump to the service mode as IRQ0 always fires at scanline 120. The results of the above code changes can be seen in this video. You can see pin 25 of the YM2203 (and hence pin 37 of the CPU) pulsing low when timer-B expires and is reset by the IRQ 0 routine. I realise that adding the correct IRQ 0 trigger mechanism will have very little effect on the single processor games (the only difference being that they'll no longer call IRQ 0 at scanline 120 but that routine is merely an ei/reti combo in all the single processor games so the timing difference, per frame, will be 18 T-states plus the overhead of servicing the interrupt). I'd still very much like to see the correct behaviour emulated, if purely for personal reasons, as I'm planning on writing an audio engine to run on the Plotting board which requires the sound chip timers to generate an interrupt and it would be beneficial to be able to test the audio engine in MAME before deploying to hardware. Thank you for all the hard work and dedication that the MAME dev team consistently put in to constantly improve MAME.